I think there must be something wrong with me, Linus. Christmas is coming, but I’m not happy. I don’t feel the way I’m supposed to feel. When I was in 6th grade I was chosen to play Charlie Brown in my school’s production of “A Charlie Brown Christmas”. Unless you are from another planet, then you know that Charlie Brown is the lovable loser of the famous comic strip “Peanuts”. 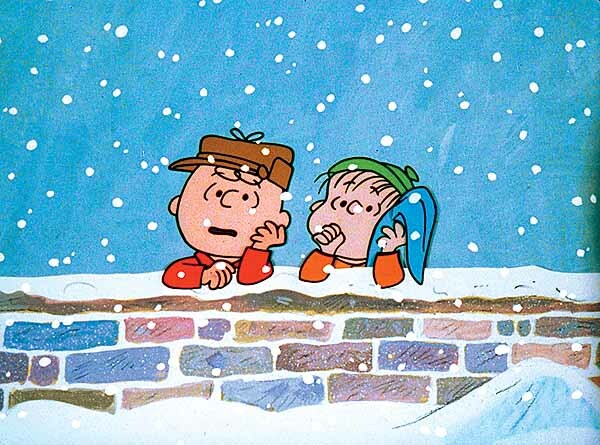 In a Charlie Brown Christmas, Charlie Brown finds himself depressed with the approach of Christmas despite all the decorations, cards and presents. As fate would have it, I was chosen in the 7th grade to play the Grinch in our school’s production of “How The Grinch Stole Christmas” Unless you’ve been living in a cave all your life, you may be familiar with the story of the Grinch, a bitter, cave dwelling creature who lives on the top of Mt Crumpit and who looks down on the residents of Whoville with distaste and envy as they prepare for Christmas. I don’t know whether it was my incredible ability to transform myself into any character (probably not) or my own somewhat cynical nature even as a kid (probably), but my experience in the past with the holidays has been similar to those two characters. I’d either get annoyed by the commercialization of the season or I’d look with disdain on those that started to scurry around right after Thanksgiving, gathering gifts and decorations like squirrels gathering nuts. In other words, I would pretty much get a case of the Holiday Blues each winter. Like Charlie Brown, I’d muddle through each season with melancholy and/or aggravation, or like the Grinch, I’d simply refuse to participate. Maybe I thought I would be able to steal Christmas and stop it from coming by staying perched on my mountain of cynicism. But come it did. Either way, I simply did not enjoy the holidays or look forward to them coming. There really wasn’t anything in my life to be depressed about. I almost always managed to get home to be with my parents and 7 siblings, never had anything tragic happen during the holidays, and always had enough money to buy some token gifts. However, I knew many people who could not say the same. Anyway, it was in the last few days of the 90s, December 25th, 1999, that I found myself sitting in the Saguaro National Park outside Tucson, Arizona. It was one of those few years that I didn’t make it back to LA. I had hiked into the desert on that clear, sunny morning to sit in the warm sun and just be by myself. At first, it felt strange that I wasn’t hanging out with some friends, or maybe even in church. But you know what? Sitting there in that magnificent desert felt more peaceful to me than any church. I realized then that I had a choice, that I could make the holidays mean whatever I wanted them to mean, or ignore them completely if I chose. I also realized that if I wanted to feel cynical or depressed, well, that was my choice as well. The reality was that I was indeed very fortunate to be sitting there in that desert in the first place, that I had someone to call if I wanted to, and that I really did had nothing to complain about. I made the decision then and there to quit playing the Holiday Blues and find a new tune. Perhaps you are out of work. Maybe you’ve lost someone dear to you at this time of the year. Perhaps you are suffering from other challenges, either emotional, physical or financial. If so, try to realize that there are many different ways you can play it, if the song you are hearing is doing nothing for you. You can create your own meaning about this time of year, one that resonates with you. You can create your own traditions. Or not. It’s your life, play your own music, what you hear deep down inside. Get some alone time, get yourself some peace. If you need help, call me. Or click on this link and dance the Snoopy Dance, if nothing else. I really don’t like to complain. Especially about my health. I guess I’m kind of stoic in that area; I figure people have enough problems of their own, so unless they’re a doctor, they really don’t need to hear about my health. I must say that I’m fortunate, as a pretty healthy fellow, I really don’t have many health issues. However, I’m dealing with a health problem now that results in a significant decrease in my energy. In addition to that, my kids were generous enough to pass along the runny nose virus they surely picked up from day care. Suffice to say that I’ve been moody, irritable, and somewhat of a drag to be around. With the exception of my wife, I haven’t really been interested in sharing that with anybody. I come from a big family, 7 boys and 1 girl, including myself. I’m fortunate that we are all in close proximity, including my mom and dad, so we are able to gather quite regularly at my parents house for food and drink. It’s been a while since I’ve seen my parents, and since they’ve seen my two girls, their grandkids. In spite of my stuffy nose, lack of energy, and sour disposition, my wife and I chose to pack up the kids today and drive out to East LA to visit the folks. Sitting at the kitchen table with my parents, wife, and a couple of brothers, the conversation quickly turned to my haggard appearance and less-then-jovial demeanor. It didn’t take much for me to let them know about my health challenges. They were interested. They asked questions. Of course, they gleefully gave me grief as well, (“He can’t handle living with three women! !”) as is their nature. Later, three of my brothers and I packed into a Subaru and went to get some food. When we got back, my sister-in-law asked me, “Why did all of you have to go to get the food?” I replied, “Because they are my brothers and I like being with them.” She didn’t believe me but it was the truth. When it was time to leave, I said good bye to my father. He gave me a big hug (and he’s not really a big hug kind of guy), put his hand on my forehead and said “Be healed, I hope you are feeling better.” And I was. Much better. The number 1 thing you should do when you’re down, depressed, out of sorts, and really challenged by life, is to reach out to someone who cares. Give yourself permission to ask for help if you need it. Put aside your pride and call or visit a friend or family member. Let them know what’s going on with you. Tell them how you are feeling. Sometimes, just talking to someone can be healing. If you don’t feel you have someone in your life who cares, then contact a mental health professional, priest or minister, whoever you feel most comfortable with. If you are so inclined, go to church, temple or mosque and talk to whoever is your Deity. Write down your thoughts and feelings in a journal, get them out of your head and onto paper where they will be much less scary. Get a massage. Get out into nature, and let the trees, wind and water nurture your soul. Nobody does it alone, so don’t feel like you have to. It may sound corny, but we really do need each other, because we are all in the same boat, floating on a little blue ball though dark and empty space, trying to make the best of it. If you are alone and feeling isolated, and have been for some time, consider that perhaps that is what you’ve chosen, on some level. You can choose different. Of course, you will have to take responsibility for how you are feeling, it does no good to keep complaining to everyone unless you are willing to take some action. But perhaps reaching out would be the first step in doing that. Letting someone know that you are not well does not mean you are weak, it just means you are human.